and the opportuntiy for brands in the print edition of AdNews out today. Subscribe here or get it now on iPad or digitally through Zinio. Carter will start in early Q3 while a team of three execs is already on the ground. She has a background in media agencies with three years at MediaCom running its Prestige team. Carter also has experience in luxury brands from a stint at The National Magazines Company, where she ran sales across its luxury portfolio. The tech company has also hired a team of three senior advertising execs, AdNews can reveal. Danni Hudson, formerly of InMobi and Yahoo!7 joins as senior sales exec, Alicia Doumanis is the senior account exec and joins from Snakk Media and ad2one. Zuzana Urbanova, former NSW and QLD state manager for Xaxis, also joins the team. A Snapchat spokesperson has confirmed the hires and says Australia is a key market for the business. Snapchat is in market pushing its ad products 3V video, sponsored lenses and geofilters. It has already rolled out local content across its Discover publisher platform for News.com.au and Fox Sports, as well as an Anzac Day geofilter. There are also Live Stories for Australian events, including Australia Day, music festival Stereosonic, the AFL Grand Final, Australian Open Tennis and Gold Coast Surfing. Brisbane, Perth and Melbourne have also featured in global 'City Life' stories on Snapchat. You can read our cover feature on Snapchat and the opportuntiy for brands in the print edition of AdNews out today. Subscribe here or get it now on iPad or digitally through Zinio. More than 10 billion videos are viewed every day on Snapchat and it's about to accelerate its growth in Australia. 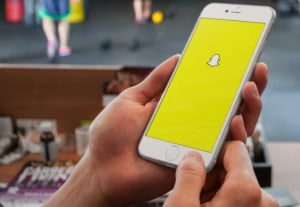 Snapchat has named former News Corp NSW sales director Kathryn Carter as the general manger for its Australian business, as the messenger app looks to grow its commercial operations in this market. AdNews revealed last week that Snapchat was on the hunt for a local business lead. You can read our cover feature on Snapchat and the opportuntiy for brands in the print edition of AdNews out today. Subscribe here or get it now on iPad or digitally through Zinio.